* Reduced visibility occurs from wiper blades, glare (particularly at night) and heavy downpours. When you are unable to see the road ahead, including other vehicles, reduce your speed. If the rain is coming down in torrents, pull over to the side of the road and wait for a respite. 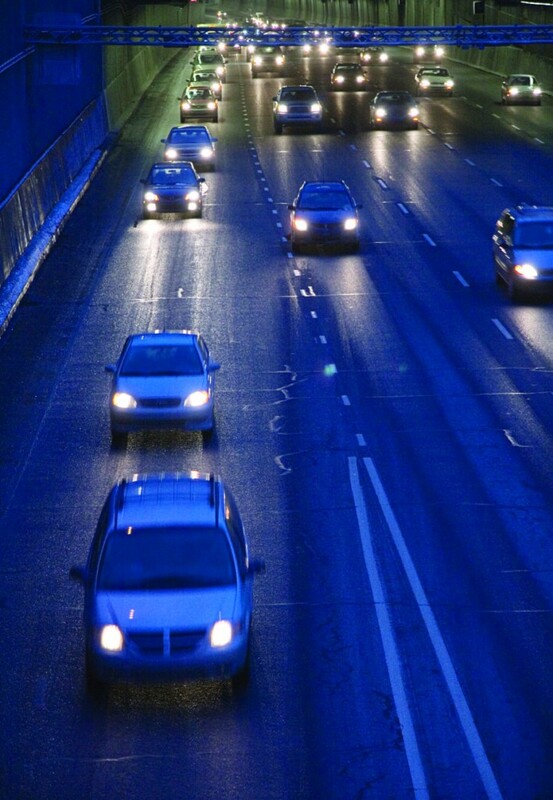 Turn on your lights to ensure you are visible to other cars on the road. * Recognize that rain can cause slick conditions. A film of water develops on the roadways, and that can affect the performance of your vehicle’s tires. Less traction means the car can slip and slide. 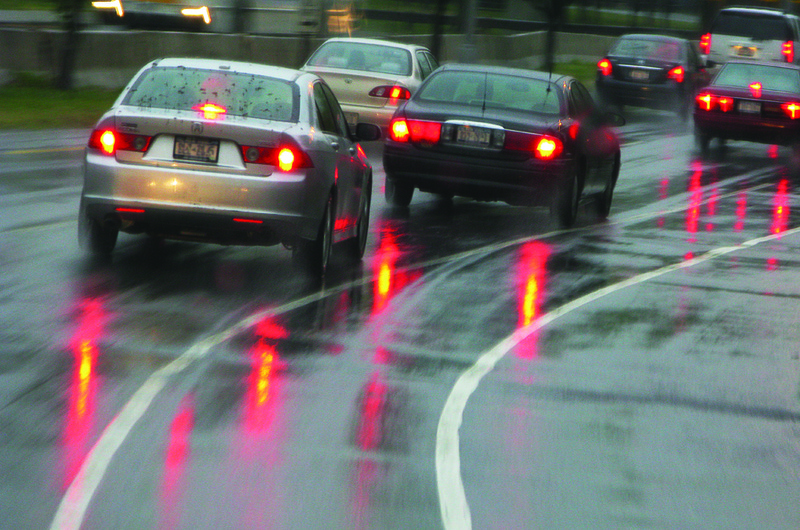 Hydroplaning, or coasting on the surface of the water, is common. 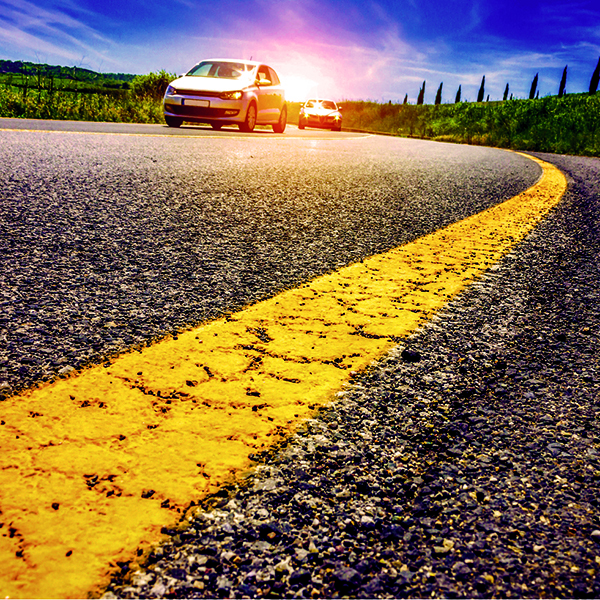 Another, lesser-known condition is slickness caused by grease and oil in the asphalt. During a long dry spell, these substances build up on the roads. When it rains, the oil and water doesn’t mix, bringing the oils to the surface and exacerbating slick conditions. The first few hours of a rainstorm can be quite dangerous until heavier rains wash the oils away. * Water spraying up onto tires and brakes can compromise braking ability. That means it could take longer to stop under wet conditions. Do not tailgate and leave extra room between vehicles. If you drive through a puddle of water, pump the brakes and test them out to be sure you can stop. Brake earlier so that other drivers understand your intentions and can react accordingly. * Avoid extremely large puddles. First of all, you cannot judge the depth of the puddle and you may end up getting stuck, especially in the event of roadway flooding. Water splashing into the engine compartment may damage electrical components. Steer around puddles to be on the safe side. * Use extra care watching out for pedestrians. A normally observant person may be distracted by the rain, puddles and wrangling an umbrella and veer into the path of cars. Be mindful of the side of the roads and where pedestrians may be, such as around parked cars. * Change wiper blades twice per year. You do not want to be caught with shoddy wiper blades in poor conditions. Without an effective wiper blade, rain cannot be cleared effectively from the windshield. * Limit distractions inside of the car to focus even more of your attention on the road. While some have become accustomed to answering phone calls or fielding questions from the backseat while driving, avoid such distractions when driving in the rain. Turn down the radio if you must and encourage passengers to remain quiet until safely home. * Leave extra time to get to your destination. Rain causes slowing down of traffic. Rushing may increase your risk of being in an accident, so always leave extra travel time when driving in wet conditions. * Make way for emergency personnel. Accidents and bad weather are common. Slow down or pull over to allow emergency vehicles to pass by. If there are flashing lights on the side of the road, move into the left lane to give a wide girth around first responders.